In today’s time, it would be hard to believe that there was a time when sailors could legally throw oil in water. That stopped with the adoption of annex 1 of the MARPOL. Other wastes like chemicals, domestic garbage and sewage stopped soon after. Annex VI of the MARPOL aimed to control NOx and SOx component from burning of fuel. Then where does this new EU regulation fit? 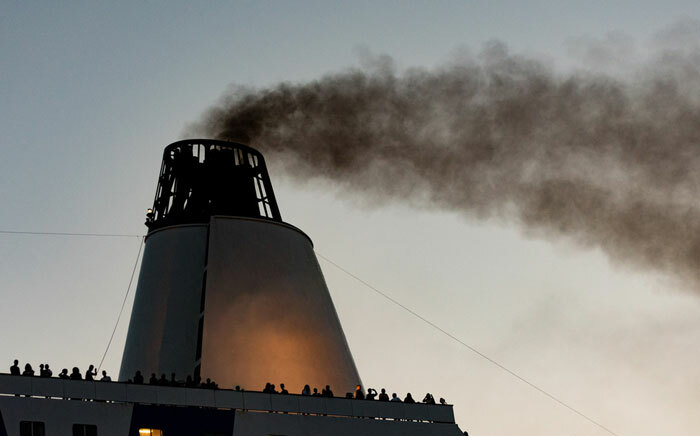 EU MRV is aiming to control the emission of CO2 from the ships. In this post, I will discuss how EU MRV aims to do that and what is required out of this new regulation called EU MRV. That is exactly what MRV stands for. The EU Regulation (EU 2015/757) lays down all the rules that answer these questions. I will answer these question right here but first, we must know to which ships this EU MRV regulation is applicable for? The aim of the EU MRV is to measure CO2 emission from a ship. But it has to be a value that can be compared with the other ships. And based on that data a conclusion of which ship (or the company) is greener than the other. Which ship is greener with respect to CO2 emission? You may be tempted to say that Ship B is greener and more environment-friendly than the ship A but that may not be true. The ship B though have produced lesser CO2 but what if ship B has been at anchor most of the time? If so, she ought to have a lesser CO2 emission. Similarly, if ship B was always half loaded, she ought to consume lesser fuel and thus emit lesser CO2 compared to ship A which is always operated at the fully loaded condition. So with EU MRV what we are looking at is not the measuring of CO2 but measuring the “average energy efficiency” with respect to CO2 emission. With respect to ship’s staff, there is nothing new in this data. Most of the ships have this data in the voyage reports. We can calculate the each type of fuel consumed by the ship during a particular period. But how do we calculate the CO2 emission? Annex I of the EU MRV also provides the default values of the emission factor of the different type of fuels. But the ship owner needs to know the emission factor of fuel being used on board their ships. At the end of the year, data for the entire year need to be compiled. From the seafarer’s point of view, they just need to report the voyage data and annual report will be compiled by the company. Some companies have integrated the required data with the noon-reporting software that the company is already using. For example, Wilhelmsen ship management has integrated the required data in the noon report tool. So the seafarers just need to enter the noon report data in this tool. Compilation of data and generating voyage report and annual report is done on shore. 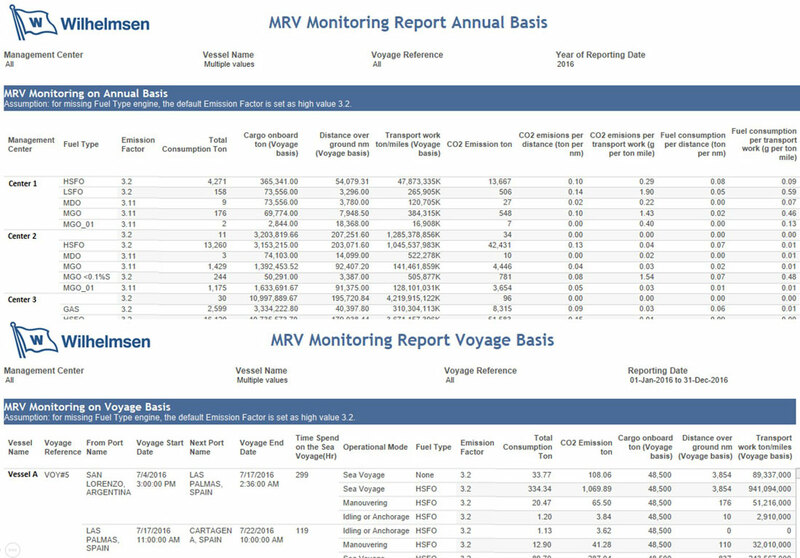 Here is how the generated annual report and voyage report looks like. Instatech marine has developed a way for automation of this whole process, that requires no or minimal manual entries. Another important aspect of EU MRV is the development of monitoring plan for each ship. The company is responsible for the development of the monitoring plan for each of their ships for which EU MRV regulation applies. The monitoring plans deal with the specific information on “what and how” of compliance with EU MRV for that ship. The procedure of monitoring fuel consumption. For example, if the fuel consumption will be calculated by manual soundings or by flow-meter? Which Fuel density to use, that mentioned in BDN or in the fuel analysis report? What emission factor to use? Procedure to calculate the quantity of cargo carried. For example what cargo quantity to use (B/L, ship figure, Vessel experience factor to be applied or not etc)? This monitoring plan needs to be developed by the company and then submitted to an independent verifier for assessment and approval. Few Verifiers have created tools for generating the monitoring plan the shipping companies. In reality, most of the companies appoint the verifier itself to develop the monitoring plan on their behalf. EU MRV has set 31st Aug 2017 as the deadline for submitting the monitoring plan to the independent verifier. But what about the ships that do not trade in EU ports and later at some point of time need to call one of the EU ports? As we discussed, the ships need to monitor and report the data as per the monitoring plan of the ship every voyage and then annually. The data of the annual report need to be sent to the European Commission through a report called “emission report”. The emission report needs to be assessed by the verifier before it is sent to the European Commission. This emission report needs to be transmitted electronically to the European commission. The first emission report must be transmitted by 30th April 2019 and subsequent reports on the same date each year. Another element of the EU MRV regulation is the “Document of Compliance”. The essence of the EU MRV regulation is the emission report sent to the European commission. To ensure that the data and format of the emission report are as per the EU MRV regulation, the emission report is required to be assessed by an independent verifier. If the emission report is as per the EU MRV regulation, the verifier would issue “Document of Compliance” to the ship. The first document of compliance would be issued on or before 30 June 2019. Document of compliance is valid for a period of 18 months after the end of reporting period. Apart from monitoring and reporting parts, EU MRV has this third important part. That is of verification. accredited by a national accreditation body. This ensures that verifier has the know how of monitoring and reporting of environmental data. There are many companies acting as Verifier for EU MRV and a shipping company has to make a choice to choose a verifier. Most of the classification societies have acquired the required accreditation and can be used as a verifier for EU MRV. But there are other companies that only specialize in EU MRV regulation. Verifavia shipping is one of the examples. Verifier needs to assess that the monitoring plan of the ship is as per the EU MRV regulations. Any non-conformities identified during the assessment of monitoring plan are communicated by the verifier to the company. The company then needs to amend the monitoring plan and submit the revised plan to the verifier for the verification. We have already discussed this. The verifier needs to assess the emission report of the ship before it is submitted to the European Commission. Verifier needs to assess the emission report for any misstatements, non-conformities and/or any errors. If any found, same are reported to the company for corrections. Verifier would issue a verification statement when the emission report is in line with the EU MRV regulations. Based upon this verification report, verifier issues the document of compliance as required by EU MRV. What would European Commission do with all the ship data that they will collect? Well, they will publish the data publically on a website. That means anyone can have the access to this data of any ship of any shipping company. This aspect of the EU MRV regulation has been controversial. Ship owners are worried that shippers would use this data for further negotiating the freight rates based upon the level of CO2 emission by that ship or the ships of that company. So the ship and the company that produces less CO2 may comparatively get higher freight rates compared to other ships/companies. And I think that is the whole purpose of European commission to publish the data publically. To put pressure on the shipping companies to reduce their CO2 foot print. Following the European Commission, on 28th October 2016 MEPC of IMO adopted an amendment to the Annex VI of the MARPOL. This new amendment requires ships of more than 5000 GRT to report fuel consumption data to the ship’s flag. Well, I will not discuss here this new IMO requirement but what I want to emphasize here is that there are many overlapping areas between EU MRV and IMO fuel consumption data collection system. In fact barring few exemptions, both the regulations have same requirements. There is one main difference between EU MRV and IMO regulation on data collection system. The data published by the EU MRV will be distinct, meaning people can get the data for the each ship and company. The data published by the IMO will be anonymous, meaning the people can see the data as per type of the ships etc but not for each ship or for a particular company. EU MRV regulation is about measuring CO2 emission from the ships of more than 5000 GRT operating in EU ports. Monitoring plan provides the information on how ships need to monitor the co2 levels. This data once verified needs to be submitted to European Commission. This regulation might turn out to be a game changer in reducing the CO2 emission from the ships even before it specifies the max CO2 emission level. This is because of the every ship’s CO2 emission data that European Commission would publically upload. The first step for the compliance with the EU MRV regulation is submitting the monitoring plan to the verifier. The last date for submission is 31st Aug 2017. Here is the brief timeline for EU MRV regulation. So if your ship is trading in European ports, is your ship ready with the EU MRV regulation? Dear Capt, Your blog has been very informative . I have been following it for the last 2 years and look forward to it for all the new updates in shipping .